‘Returning customer’ is not a good header for your sign in form when you offer a ‘guest checkout’ option. 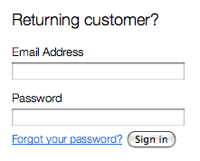 When conducting our checkout usability research I noted that quite a few e-commerce sites use “Returning customer?” as the header for their account login form, even though they offered a “guest checkout” option. This of course makes little sense as returning customers don’t necessarily have a user account – they might have chosen the “guest checkout” option the first time around. So while the header speaks directly to all returning customers, saying “look here, my content is relevant to you”, it is actually the opposite in many cases. A test subject actually picked up on this even though none of them ever tested the same site twice in our study. This example perfectly highlights one of the issues of poor copywriting online: setting a misleading context. This is particularly dangerous when dealing with forms because most form fields look identical and are thus defined solely by their context. Authored by Jamie Appleseed. Published on June 28, 2011. In general, I find your theories very intuitive, but I feel the content here would be more powerful with empirical data. Have you found that replacing “Returning customer?” with “Sign in” or “Have an account?” significantly increases conversion rates and/or revenue per visitor?